It's time for another episode of 205 Live on the WWE Network! What's next for the WWE Cruiserweight Champion Neville and his #1 contender Enzo Amore? It's been advertised that Neville and Enzo will have a face-to-face confrontation on tonight's go-home show before WWE No Mercy this Sunday. What's going to happen? Tune in to find out and hit F5 to refresh the live recap! We get a video package for Neville regaining the Cruiserweight Championship, then Enzo Amore debuting on 205 Live, joining the cruiserweight division and becoming #1 contender, and the ensuing title match they will have this Sunday. Last night on Raw, after Braun Strowman beat Enzo down, Neville took advantage of his knocked-out challenger hitting the Red Arrow. Cue the opening video and theme song! Vic Joseph and Nigel McGuinness welcome us to the show in Oakland to talk about tonight's events including a face-to-face between champion and challenger. But first, Cedric Alexander has unfinished business to take care of. Last week on 205 Live, we saw the shocking heel turn of Jack Gallagher, and even more shocking that he has sided with Brian Kendrick. Alexander blocks a kick, hits the big back elbow, backflips into a hurricanrana, dropkicks him to the outside and hits a suicide dive. Kendrick slams his head on the ring apron, Alexander with a big right hand, throws him back in the ring at 8, goes for a springboard, Kendrick moves out the ring and kicks him in the head getting a near-fall. Kendrick whips him back-first hard into a corner, picks him up grabbing the beard, whips him across the ring with velocity again, butterfly suplex, covers for a 2-count, then puts him in a rear chinlock. Alexander fights back up, fights out, but gets his face slammed on the top turnbuckle, then sticks his boot up and side steps him. Kendrick does a Japanese armdrag into the turnbuckles, makes the cover but Alexander is too close to the ropes, sits on his back and pulls back on his ears then puts him in a straitjacket chinlock. Alexander battles out, fights back with forearms, Kendrick hits a running elbow, Alexander falls onto the apron, kicks him in the head, connects with the springboard clothesline and gets a near-fall. Kendrick avoids the handspring backflip, hits a calf kick, gets a 2-count, Alexander rolls through the Oklahoma Roll and gets the 3! WINNER: CEDRIC ALEXANDER. Kendrick follows Alexander up the ramp, Alexander turns around to spot him, and Gallagher blasts him from behind! Gallagher wails on him, Kendrick puts him in an abdominal stretch, Gallagher kicks him in the gut and levels him with the headbutt! Cedric Alexander is OUT! Gallagher walks to the back with Kendrick as referees check on Alexander. Drew Gulak walks in the back holding a sign that reads "NO CHANTS" and he's coming up next. Backstage, Dasha Fuentes stops Gallagher in the back asking why he is acting like this. Gallagher says he has had stitches on the day of his nuptuals, and would rather live life with a scar than as a joke. Drew Gulak heads to the ring holding his sign and we get clips from last week where he was interrupted by Breezango. Gulak stands atop the announce table with a microphone. He says he will be a guest commentator but first he has to say something. He calls last week "an unjust persecution" by the Fashion Police, Breezango. "They will be hearing from my attorney, who is in fact myself." He adds if Galileo was alive then he would be disgusted by Akira Tozawa "and his incessant chanting." Gulak goes on to compare himself to Galileo then calls himself a 205 Live Hall of Famer. "I look into the future and I see the rest of my PowerPoint Presentation!" Slide 6 (of 277) is No Cell Phones. "If you millenials put down your cell phones and pay attention to my Powerpoint Presentation, you might actually learn something!" Gulak gets interrupted (once again) by Tozawa coming out for his match. They lock up, Tozawa backs him into a corner, clean break, they lock up again, Dar backs him into a corner, no clean break with a kick, Tozawa rolls through a sunset flip and kicks him in the chest then hits the senton cannonball for a 2-count. Tozawa stomps him down in a corner, Dar comes back with a soccer kick to the leg, gets a 2-count then goes to work on his left leg. Dar puts him in an armbar next, Tozawa gets to his feet, battles back, chops to the chest, Dar ducks one, Tozawa lands on his feet, forearm, suicide dive, throws him back in and covers for 2. Dar blocks the saito suplex, does a dragon screw, European uppercut, covers for 2 then puts him back in the leglock. Dar covers for 2, Tozawa kicks him in the head, gets on the top rope, connects with the diving senton and gets the 3-count. WINNER: AKIRA TOZAWA. Tozawa does his chant staring at Gulak, who looks on with a scowl. We go back to last week where Rich Swann got the victory over TJP. Back in the locker room, TJP congratulates Swann on his victory, they shake hands and TJP offers a chance to team up. Swann doesn't think it's a good idea and has to focus on Lince Dorado tonight. TJP wants to have one more match, Swann doesn't want to, and TJP looks disappointed. Rich Swann vs. Lince Dorado is next, but when Lince Dorado's music plays he doesn't come out. We cut to backstage where he's been attacked and hurt. Swann heads to the back to check on him... BUT TJP ATTACKS SWANN at the curtain on the stage! TJP steps on his face shouting "You think you're better than me?! You can't handle this!" - he's even ripped one of Swann's dreads from his head! TJP kicks him in the ribs for good measure, scowls, then does a military press dropping him on top of the crowd fence. A promo for No Mercy this Sunday airs. 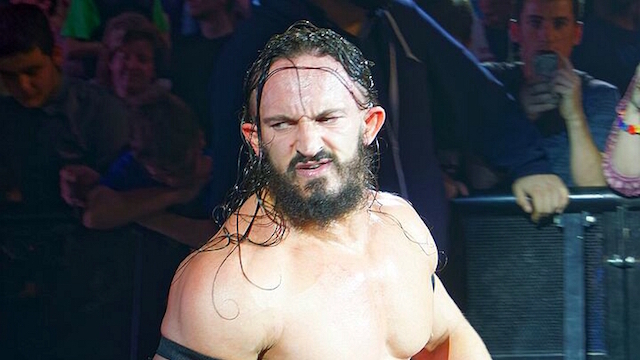 WWE Cruiserweight Champion Neville heads to the ring for his face-to-face controntation with his challenger. Neville: "Ladies and gentlemen, we are just 5 short days away from one of the biggest PPV extravaganzas of the year, WWE No Mercy. That's right. This Sunday, live on the WWE Network, you lucky lucky people will get to see mammoth clashes as Braun Strowman collides with 'The Beast' Brock Lesnar. And John Cena dukes it out one-on-one with 'The Big Dog' Roman Reigns. But better than all of that will be a comedic performance as little Enzo Amore challenges the conquering King of the Cruiserweights in what can only be described as the most ridiculous decision of his pathetic little life. Now don't get me wrong, I will take pleasure in exposing Enzo Amore for what he really is - a stain on the moral fabric of society, but more importantly somebody who is grossly underqualified to step into my world." Enzo Amore takes the opportunity to come out now, and he's wrapped up in bandages. Enzo: "My name is Enzo Amore, and I am a certified G and a bonified stud, and you can't teach that! Bada-boom, realest guy in the room. How you doin'?" Neville: "Isn't this just classic? Enzo Amore, last night lad, you got obliterated by 'The Monster.' If I were you, I'd stay at home resting and recuperating, but here you are dancing like a dicken and spouting your hilarious catchphrases! How are you doin'?" Enzo: "How you doin', huh? Normally, I would ask you that question. But I don't need to ask you that question because I already know the answer - you're jealous. I must be peanut butter for that jelly, 'cause you've been jelly of me ever since I made 205 Live the realest show in the room." Neville: "Hahaha. Me? Jealous of you?? Look at me Enzo, then look at yourlself. I am the most formidable cruiserweight on the face of planet Earth. How can I possibly be jealous of you when I am better in every way that is conceivable?" Enzo: "See, there's some truth to that statement as well. I am not the in-ring performer you are, I'm not the wrestler you are, but that is precisely why you are jealous! You wanna hate on Enzo? Hate on me. Let me tell you something, hate ain't nothing but love disguised as jealousy. If I were you, I'd be jealous of me too 'cause no matter what the win-loss record says, I am twice the superstar that you will ever be. I put the superstar in WWE Superstar. I'm taking media showers, I'm in commercials, I got a Snickers bar, I have my own emoji bro. You ain't sellin no merch, you ain't getting invited to MizTV, and you ain't hanging out with Drake and The Weeknd on the weekend. Now let me say this, OK? I know it's been brought to light lately that the locker room and I don't get along. But you know what Neville? When I come out and they play my song, the people sing along 'cause they and you know what I'm on. I'm never off, I'm always on. On this microphone, I'm ichiban, numero frickin' uno! You can hate me, you could love me, but either way you know who I am. I'm a certified G and a bonified stud. Hydrated off the haterade and showered in this love, and it eats you up 'cause I got a mouth on me. And I think you know that I got three rows of teeth 'cause the way I see it is you've been a big fish in a small pond. I'm looking at the envy in your eyes just like the first time I ever stepped foot on 205 Live. I think you realized then and there that moment that a shark had invaded your water!" Neville: "You had to go and run your mouth, didn't ya? You see Enzo, I wanted to make this quick, but now I am going to make an example out of you. Treat me like a game and I'll show you how it's played! Look at me Enzo, look at me! Do you honestly, genuinely believe for one second that I care about merchandise sales? That I care about celebrity relationships? Enzo, do you think I care about being a superstar? Nah, none of that stuff matters. Come Sunday, none of that matters because you lad, you can't fight. And me Enzo? I am brutal, so what exactly are you going to do when I brutalize you to the point where you know there's no hope? What you going to do Enzo? Are you going to kick me in the crown jewels? Or perhaps you'll coax me into grabbing a microphone and get myself disqualified like you did to The Miz? Either way, those tactics are not going to win my championship. The best you can hope for at No Mercy is survival." Enzo: "You know what? You're right. Those tactics are not gonna win me a championship. But it ain't Sunday, and this ain't No Mercy." Enzo kicks Neville in the balls! "How you doin'?" Neville drops and writhes from the groin kick, Enzo exits the ring staring back at the champ, and No Mercy is this Sunday.